Are you looking for specialist upholstery cleaning services in London? Please do not ignore your upholstery! Sofas are usually the items in your home that need cleaning and sanitising the most. Our cleaning company in London can clean your sofa and armchairs in your home, commonly at the same time as end of tenancy cleaning, carpet cleaning, one-off cleaning, domestic cleaning or leather cleaning and general cleaning take place. 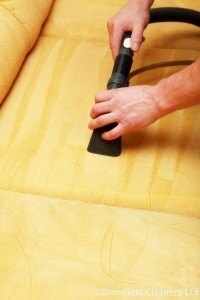 Our upholstery cleaners are able to clean all types of fabrics including leather upholstery. The specialists at Domestic Cleaners Ltd can treat your upholstery and return the loveliness and prolong the life of your loved furniture, deep cleaning will bring back the lively colour. Our upholstery cleaners can also coat your furniture with an anti-stain treatment to extend the life of the material. The Wet Cleaning – this makes use of high pressure steam for deep down cleaning towards the root of the fibres and is protected for use on most materials. The Dry Cleaning – an uncomplicated, secure and productive way of deep cleaning your delicate fabrics using no-moisture foam. If you are getting your carpet cleaning done, you might want to consider touching up and freshening the upholstery fabrics at the same time. Perhaps you think it is not necessary or worth the effort, however, would you consider the thought of wearing the same clothes for days on end without washing them? The case should be the same with cleaning your upholstery. Contact Domestic Cleaners Ltd now for a free upholstery cleaning quote on 020 8884 9146 or book online today!